%16 Jul 2016: At last...I've found my smell! I think I’ve finally found my smell! Approx 20 years ago while on a train going to London, I complimented a young woman on her perfume. She told me what it was and I promptly forgot. As we were leaving the train, she rummaged in her bag and produced an almost empty perfume bottle, and handed it to me! I never forgot her generosity. There was nothing on the bottle to indicate what it was except for the word ‘Balenciaga’ embossed on the base. I used it up pretty quickly! Over the years, I forgot all about it. The empty, fluted, squat glass miniature bottle with glass stopper has sat with all my other smells, too pretty to throw away. I recently had a desire to hunt it down via ebay. I only had the word Balenciaga and the empty bottle to go off, but after a bit of detective work, and one mistake purchasing the wrong scent ‘Le Dix’ (the bottle seemed to be generic for this particular perfume house) I think I’ve finally found it. It’s ‘Quadrille’. I won’t try to describe the fragrance like the poncy perfume connoisseurs do (what the heck does ‘amber’ smell of anyway?). Just imagine opening a lady’s portmanteau on the Orient Express in the 1940’s. Nestled snugly under her dusky pink lace girdle, you find her vanity case. You open it…and inhale the warm, musky, seductive, intoxicating aroma. That’s Quadrille. Ok yes, it smells of your granny’s face powder. But that is such a wonderful smell! …and it’s discontinued! 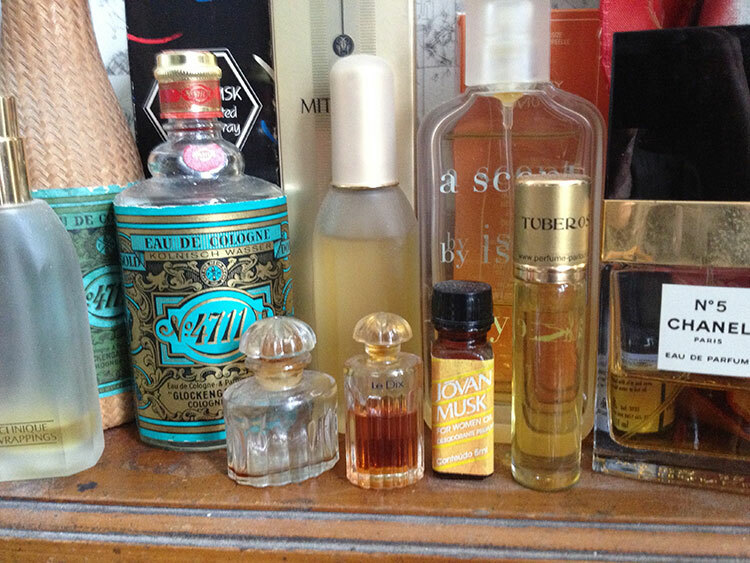 Why do I fall in love with vintage smells?